The 3DS eShop has a few options when it comes to music composition, with the latest being Musicverse: Electronic Keyboard. Abylight is keen to highlight how its creative and sharing tool can be used, and has recruited a highly-regarded composer to help with the task. Tsukasa Tawada worked in sound design in four Dragon Quest titles in the '90s, and has composition credits in a number of Pokémon spin-offs - notable recent credits include Pokémon Shuffle and Harvest Moon: The Lost Valley. The video below shows him getting to grips with the app, before sharing a short sample of a track he's composed for it - 'Tokyo Polka'. 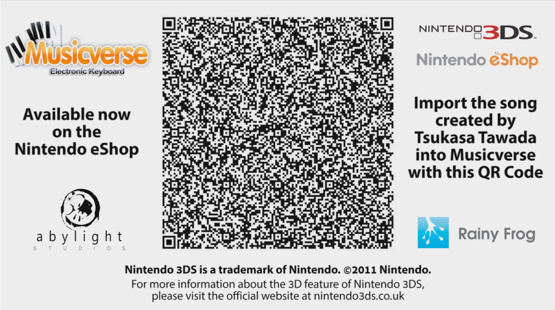 Those with the app can get the full track using the QR code below. Are you a fan of Musicverse, or perhaps tempted by it now that you've seen Tawada-san put it to the test? Cool, actually seems pretty good, might buy. I'm enjoying their reactions to the app. That is one heck of an endorsement! I had a go at being a Pokemon Composer recently. This is what I came up with. Who's to say what 's better to be known for: obscure spin-offs or causing the mass depression/suicide of thousands of Japanese children, which was totally a thing that really happened? That was ballin'! Did you use Musicverse? @J-Manix98 Thank you very much. I didn't use MusicVerse, but I am intrigued by it. That was produced in bog-standard GarageBand, which despite not having an amazing selection of pre-set instruments, is actually quite customisable if you mess around in the 'Sound Generator'. The main lines were written on guitar, and then just dragged note-for-note into the GB's 'Piano Roll'. The main advantage of having it on computer is it makes it so easy to share; it's not permanently stuck in whatever piece of software you used to create it, or tied to a specific sharing website. You can easily save the track as an mp3 in your main music library, and then chuck that mp3 into Soundcloud (or YouTube or wherever else on the web you want). I think that's why I'm slightly cautious about music Apps for portables and Smart Devices; they kind of seem 'locked away' in comparison. 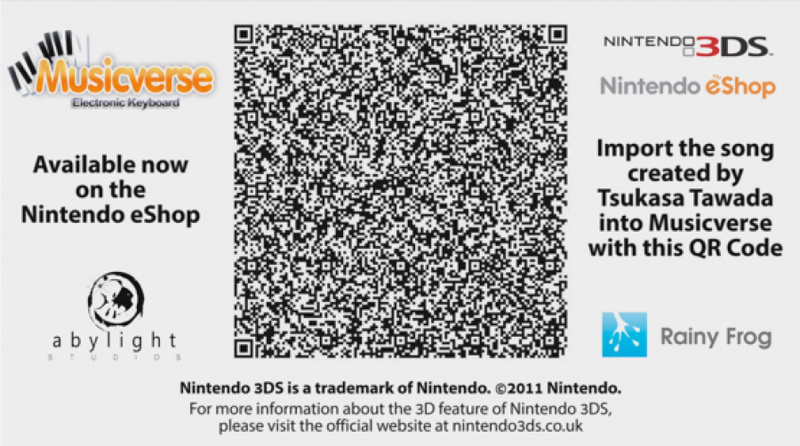 And the 3DS's lack of multi-touch would mean you couldn't actually play chords. I'll keep an eye out for a review though. It might be useful for piecing together a few ideas 'on the move'. Awesome! Yeah, I have been wanting to get to know garage band a bit better. Still haven't done much with it, haha! Seriously though, that sounded like it could have easily been an in actual Pokemon game. Keep it up! @Minish Sorry, I'm a little confused - could you clarify? Do you mean plugging a 3DS into a computer, and then recording onto the computer, but using the 3DS software, or using the 3DS as a part of some computer software or... something else? First post, hi everybody! I have all the other 3ds music apps but this one.. Until now that is! Very cool! I got kind of disappointed with this app. You can't really record stuff in a convenient way. @Maxz That was dope! It sounded just like Pokemon battle music. Lol is this some secret preview of sun/moon? I'm really glad you like it. I wrote it after listening to a lot of older compositions from the franchise (which still remains some of my favourite music ever), and I wanted to make something that had some of the qualities I loved from those songs. Unfortunately, a lot of the XY music is quite a drastic departure in terms of both composition and instrumentation, so despite having just written that song, it probably wouldn't fit in with the new games for sounding too 'dated'. @Maxz That's on purpose though, right? Each generation they add in regional influences - so the BW had loads of guitars but XY had more, like, floaty accordions. Even GSC had lots of kyoto stuff, like more pentatonics I think. @Maxz Don't know what kind of music they have in kyuushuu xD. But I prefer kyoto and paris. @proboscus That's a really valid and interesting point. The HGSS version of Ecruteak City in particular doesn't shy away from traditional instrumentation. RS went all out with the horns (although I'm not sure if Hokkaido is particularly renowned for its wind music), and BW definitely had an edgy "New World, New York' guitar thing going on, so I guess its always been reasonably hard to predict exactly what the next games are going to sound like. That said, I think X and Y probably marked the biggest change in overall style. There's been a music tournament going on in the forums pairing different gym leader themes off against each other, and the one that stands out the most is definitely X and Y's theme. It's more of a soundscape than anything else, and most of the songs from the game have got got a broader, less "MIDI" feel to them. Though despite that, I think I prefer most of the music from the games that preceded it. Maybe I'm just a slave to nostalgia. I'm looking forward to SuMo too. Okinawa is a fantastic suggestion. I'd been thinking it would be Hawaii, given the run of popular tourist locations from Japan. Maybe Okinawa and Hawaii could BOTH make an appearance. Anyway, I imagine there'll be steel drums in abundance (and who knows, maybe even a Steel type steel drum Pokemon). I know a lot of people were disappointed by the lack of information given in the direct, but it's certainly kept us on our toes, and that's kind of fun in itself. @maxz I think the biggest problem with the SuMo announcement was that it leaked beforehand x_x. So there was time to get our expectations up. I really loved XY because it felt like Pokemon in Paris. Or the Japanese idea of Paris which is even better xD. And the Elite Four was so pretty. Best on any game. Tho my fave game is silver! XD. I hope it's okinawa but everyone thinks hawai. Japan is the classic pokemon location though... And they haven't done okinawa.